Download the unofficial app of the New England Patriots and follow your favorite football team with access to the latest news, roster information, highlights, interviews and much more. The iPhone and iPad app contains complete player profiles with pictures and biographies, as well as a comprehensive news area with fan blogs and media sources; giving users access to injury reports, trades, draft picks, and a wide range of other team-specific and NFL-related information. Other highlights include player Twitter feeds and media content such as fan submitted photos, highlights, and press conferences. 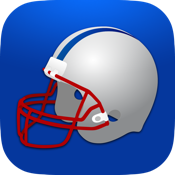 New England Football App is NOT affiliated in any way with the NFL (National Football League) or the New England Patriots team.